Discussion in 'Colored Gemstones' started by mercoledi, Mar 9, 2009. The small round is a Sri Lankan chryso that's slightly more saturated than the Mastercut chryso irl. The Chryso seems lovely--its so rare to see larger Chrysoberyl with nice cutting. It looks like it loves the light. It does indeed and I plan to set it into a ring sometime soon. It does have some dust like particle inclusions on one side that, visible to the naked eye when they catch the light. Not a biggie for me. My first gem from Earthstreasury has arrived. Its 6 mm and 0.93 carat. I really like this stone, although it’s a little bit moody. To my fortune I love all of its moods! These are my pictures all taken by artificial lightning, unfortunately no sunshine today. Maybe I can update tomorrow. missy, Hivona, Skylight and 8 others like this. Dkata, that is beautiful! Is that a montana sapphire? The vendor's photos seem to be more pastel compared to your photos, how do you find it in real life? Brilliant concave spinel 0.51 cts from KosnarGemCo. It's hard to get the color right in picture. The first vendor pic is pretty accurate, but of course it sparkles more in real life. In incandescent light, the spinel is more saturated in real life. Arkteia and missy like this. @Skylight sorry, I’ve just realized, I haven’t specified, that it’s a Mahenge Garnet. You are right, the vendor picture seems more pastel, but a garnet is moody and really hard to capture. I like the moods of this small gem and can’t wait to set it. @Skylight I have managed to take a better picture in natural daylight. It’s sunny, but freezing cold, we have -5 C.
missy, Hivona and MrsKMB like this. The color is hard to recreate, but it really has a nice color! I like the color in your photo better than in his. It’s beautiful! I just received my pink spinel and pink tourmaline from Jeff White. Beautiful! JrJ, mochiko42, Hivona and 7 others like this. 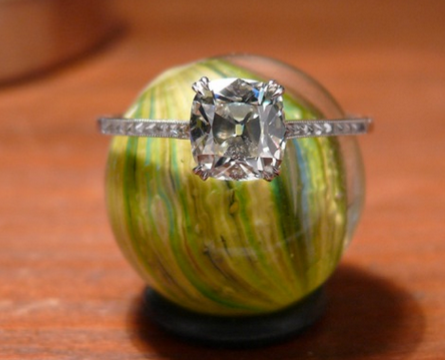 The 2nd stone is STUNNING? Is that the spinel? The second is the tourmaline. Isn't it crazy?! Stunning. I need to reconsider my ambivalence toward tourmalines! I love spinels and have had this gem on layaway. Thank you, Elle W.! This is a lilac spinel cut in a star 80 design by Gene Flanigan. The color shifts from a lavender to a plum depending on the lighting. Forgive my iphone pics. I have no clue as how to use any of the photo editing features. missy and LisaRN like this. Gawd I love this pink color! And it is a perfect complement to your gorgeous pink nails. leslie1956 and MrsKMB like this. Beautiful lilac spinel! I love that it shifts from lavender to plum. Beautiful! (I want to eat all these amazing gems. They are so beautiful)! leslie1956 and Skylight like this. I buy anything and everything pink! It makes me happy. It's also led to some poor decisions, but so be it. Hivona, Burmesedaze and missy like this. I am like that with blue. But pink is pretty darn pretty too and goes very well with blue! My niece (who is 10) loves pink and (almost) everything she owns is pink. I wonder if she will always love pink to that degree or if her tastes will change. When I was her age I was obsessed with purple. I love purple still but not to the degree I did when I was little. @MrsKMB Did you always love pink as much as you do now or was there another color you preferred when you were younger? I have always loved pink. Right now, I'm wearing pink PJs, on my laptop with a pink case. I just painted my nails pink. I'm looking over at one of the dogs on a pink blanket, and earlier today I used my pink Kitchenaid. You get the picture. My daughter has always loved pink, but prefers more of a hot pink. The other one has always loved purple. But I look better in red. Go figure! Well pink and red are closely related IMO. And I love pink and red together. First Pluto, now this? Science takes all the fun stuff away. I know, of course, that all colors are just waves of light, so every color we “see,” we see with our brains. But what this video says is that there is no such thing as a band of wavelengths that mix red and violet, and therefore, pink is not a real wavelength of light. That’s why pink is an invention. It’s not a name we give to something out there. Pink isn’t out there. princessandthepear and MrsKMB like this. I bought an aquaprase from acstones.com. It is 12.73 cts., 22.6 x 14.5mm oval cabochon. Barry described it as "This gem has a medium blue-green color and has more of a bluish component than most. It is free of inclusions and is quite translucent." keithcook07, Rfisher, princessandthepear and 5 others like this. So yummy gemmy looks delish to eat! mtsapphirelovingannie and missy like this. Oh I love this color. I wanna go swimming in it. I purchased a 4.0 ct tourmaline and a 2.2 ct mahenge garnet from Rioux Rocks, and they arrived today. They are beautiful gems, but I'm probably going to send the garnet back. I don't love it enough for the price. I'm on the fence with the tourmaline, since I prefer more blue than yellow. @MrsKMB thanks for the pics! I bought a tourmaline in a similar shade and cut so it's fantastic to be able to see what yours looks in real life vs the vendor photo. I'm taking a gamble and having JD set mine, sight unseen! The Tourmaline has more of a yellow hue? He has a lovely blue tourmaline he just posted about too. I’ve been eyeing it forever - it’s a lovely cushion. Do check it out. I see yellow, or a lighter green, along the edges. I figured since yellow & blue make green, I was safe to say it's yellow, but it's probably some random color from an element in tourmaline. I did see his blue tourmaline. I think I'm just going to text him and pick his brain about the different gems. He's just the nicest guy, and I want to support him. Colored Gemstone Nut, suzanne2 and Gemobsessed like this.